The global isothermal bags & containers market has witnessed impressive growth in the past few years, due to growing trade across the globe. Growing exports and imports between the countries and safe transportation of products has paved the way for isothermal bags & containers market. A number of other factors are expected to drive the isothermal bags & containers market, such as capability of keeping product fresh and maintain cold chain during transit. Fast growth in organized retail sector, especially in emerging economies, is expected to fuel growth of the isothermal bags & containers market. Despite the positive outlook, there are a number of factors that always leave a space for product damage during the transit, ultimately hampering the growth of the isothermal bags and containers market. Globally, by material type, the polyurethane segment is estimated to dominate the market, in 2018, with 32.2% share of the market value. The nylon segment is anticipated to witness rise in market share, with 9.8% market share in 2018, it is estimated to reach 10.2% during the forecast period. The global isothermal bags & containers market by product type, has been segmented into bags and containers. Among product type, the container segment of isothermal bags & containers dominates the market with 95.3% market share in 2018. Bags segment of isothermal bags & containers market is expected to grow at an impressive CAGR of 6.9% during the forecast period. Among the end use segment, the pharmaceutical segment is anticipated to dominate the market, during the forecast period. The global market has been segmented into five regions, i.e. North America, Europe, Asia Pacific region (APAC), Latin America and Middle East & Africa (MEA). The MEA region is projected to register the highest CAGR of 8.1%, during the forecast period. A few of the key players in the global isothermal bags & containers market include Cryopak Europe, Sonoco Products Company, Sofrigam SA Ltd., Pelican Biothermal LLC, va-Q-tec AG, ACH Foam Technologies, LLC, Cold & Co Sprl, Tecnisample s.l., Saeplast Americas Inc., AccsA'tech Medical Systems, Tempack Packaging Solutions, S.L., Advanced Products Portugal, Cold Chain Technologies, Envirotainer Ltd., American Aerogel Corporation, Snyder Industries, Inc., Inno Cool India Private Limited, Insulated Products Corporation, Exeltainer SL and TKT GmbH among others. A majority of isothermal bags & containers market manufacturers are mainly emphasizing on expanding footprint through mergers and acquisitions, thereby enhancing their product portfolio and quality. Brand owners’ preferences regarding isothermal bags & containers are also expected to be driven by the type and size of bags and containers used. Transparency Market Research examines the global isothermal bags & containers market during the forecast period 2018-2026. The primary objective of the report is to identify opportunities in the market and present updates as well as insights pertaining to various segments of the global isothermal bags & containers market. The report begins with an overview of the global isothermal bags & containers market, evaluating market performance in terms of revenue, followed by TMR’s analysis of key trends, drivers and restraints witnessed in the global retail as well as isothermal bags & containers market. Weighted average pricing analysis of isothermal bags & containers based on product type is also included in the report. To compute the market size, in-depth secondary research is done. Data points such as regional splits and market split by product type, material type and end use have been assimilated to arrive at the market estimates. The report comprises the forecast of the global revenue generated by sales of isothermal bags & containers across the retail industry. TMR triangulates the data via different analysis based on supply side, demand side, as well as dynamics of isothermal bags & containers market. TMR not only conducts forecasts in terms of value, but also evaluates the market on the basis of essential parameters, such as Year-on-Year (Y-o-Y) growth. This helps providers to recognize the future opportunities as well predictability of the market. In order to understand and assess opportunities in this market, the report is categorically divided into four key sections on the basis of product type, material type, end use and region. The report analyzes the global isothermal bags & containers market in terms of value (US$ Mn) and volume (‘000 Units). Vital feature of this report is the analysis of the global isothermal bags & containers market by region, product type, material type, and end use; and the corresponding revenue forecast in terms of absolute dollar opportunity. This is traditionally overlooked while forecasting the market. However, absolute dollar opportunity is critical in assessing the level of opportunity that a provider can look to achieve as well as to provide potential resources from sales perspective of the global isothermal bags & containers market. To understand key segments in terms of their growth and performance in the isothermal bags & containers market, Transparency Market Research has developed a market attractive index. The resulting index should help providers identify existing market opportunities in the global isothermal bags & containers market. 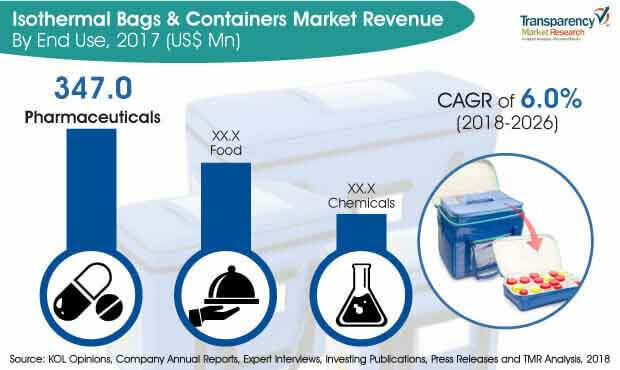 In the final section of the report, isothermal bags & containers market competitive landscape has been included to provide a dashboard view of companies that manufacture and provide isothermal bags & containers. The report contains company profiles of some of the players in the isothermal bags & containers market. Few of the key players in the global isothermal bags & containers market include Cryopak Europe, Sonoco Products Company, Sofrigam SA Ltd., Pelican Biothermal LLC, va-Q-tec AG, ACH Foam Technologies, LLC, Cold & Co Sprl, Tecnisample s.l., Saeplast Americas Inc., AccsA'tech Medical Systems, Tempack Packaging Solutions, S.L., Advanced Products Portugal, Cold Chain Technologies, Envirotainer Ltd., American Aerogel Corporation, Snyder Industries, Inc., Inno Cool India Private Limited, Insulated Products Corporation, Exeltainer SL and TKT GmbH among others.